In 1977 oil began to flow from the Arctic through the Trans-Alaska Pipeline (TAPS) to the ice-free port of Valdez. The project's magnitude prompted comparisons with American engineering feats of the past such as the transcontinental railroads and the Panama Canal. The proposal spawned a debate commensurate with the project's size. Congressional authorization in 1973 was preceded by a four-year controversy that was one of the most passionately fought conservation battles in American history. 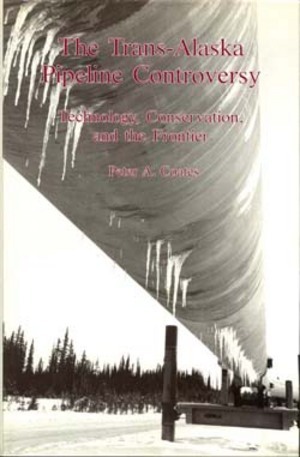 The Trans-Alaska Pipeline Controversy, winner of the Lehigh University Press Science, Technology, and Society Studies award, chronicles the evolution of conservationist concern over Alaska since American acquisition. This involves reviewing those developments that aroused concern, investigating the changes in the nature and strength of this concern, and considering the character of the debates over these issues. From a historical standpoint, Peter A. Coates sees the relationship to earlier engineering projects and technological innovations in Alaska―and the debates that accompanied them—as the most intriguing aspect of the pipeline controversy. While studying the pipeline conflict, he also looks at events between the Second World War and the discovery of oil on the North Slope in 1968. In an introductory chapter, he notes that the book's scope is extended back to the beginning of the American period in Alaskan history (1867). This achieves a fuller understanding of conservation controversies in Alaskan history. It also provides an overview and a synthesis for those unfamiliar with Alaskan history. Though TAPS was the first large-scale postwar engineering project to materialize in Alaska, it was not the first substantial modern challenge to the environmental status quo there. Large numbers of conservationists did "discover" Alaska when the pipeline was proposed in 1969, but this was not the first time that interest and serious concern had been aroused. The process of emerging awareness and growing involvement can be traced through the campaign to create the Arctic Wildlife Range and the opposition to abortive schemes in Project Chariot, a nuclear engineering proposal, and the Rampart Dam hydroelectric plan. Comparison between Chariot and Rampart on the one hand, and TAPS on the other, reveals many obvious differences (not the least that the pipeline was built). During the pipeline controversy the stakes were higher, the adversaries were more numerous and powerful, and the attentive audience was larger. However, there were plenty of common themes, and Coates pays particular attention to one recurring feature of Alaskan conservation debates: a preoccupation shared by conservationists and their opponents with the significance of Alaska in connection with the frontier idea and the frontier's meaning for American history. This book demonstrates how Alaska and the various debates over natural resources have a central position in American frontier history and the history of conservation.